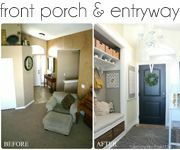 A Kitchen Re-Style: Part 5 - Window Treatments, Seating & Giveaway! I wonder how many 'parts' this kitchen re-style series will have? I guess most bloggers would do a re-style post in the typical 1,2,3 part fashion... but HEY, this is real life people, and our remodels and re-styles don't happen in 1,2,3's, mkay? There are a LOT of components to completely making over a space! The two biggest that I can think of are money and TIME. I'm sure a bunch of you can relate when I tell you that I could literally pick ONE thing on my to-do list of hundreds, and JUST work on that ONE thing, all day. Whether it's being a Mom, doing laundry, preparing meals for the week, focusing on weight loss, blogging or redecorating; but guess what? That ain't NEVER gonna happen (for me anyway). Around these parts, we've always got a million plates spinning around in the air. The trick is to just keep as many going as possible, without losing your cool. That being said, there ARE those times, at the end of a long week when you suddenly realize that one or two of those spinning plates has disappeared; and it feels GREAT! For us, this happened about 2 weeks ago when we added in the LAST big piece of the puzzle into the eating nook in our kitchen. It was a busy Thursday morning when we finally got the call from Black Goose Design that our new, special order settee for our kitchen was here and ready for pickup! Oh yeah, that's right, it's an armless, wheelable, washable settee people!!! I honestly can't tell you HOW happy we are with this plush, durable, gorgeous settee. It's easy to get in and out of, it can easily sit three adults and it's comfy to the MAX! One of the biggest goals for our little home is to make it as functional as possible, regardless of the size. We wanted to fit as many people as we could around the largest table that we had space for, and with our final number now reaching a whopping 8, we've accomplished just that... counting the bar stools, we're at a total of 11 seats all together! "The Teeny-Tiny Kitchen that Could." Another big change that happened in this space a few weeks before we got our settee was our new window coverings! When we moved into the house we bought Faux wood blinds for all of our windows, but found out quickly they weren't cut out for the job they needed to preform. The back part of our house (where the eating area, kitchen and family room is) heats up like you wouldn't believe in the evening; making it almost unbearable in the Summertime to cook a hot meal in the kitchen after about 6:00pm. We knew we needed more protection from the heat and sun, but weren't quite sure what to do. 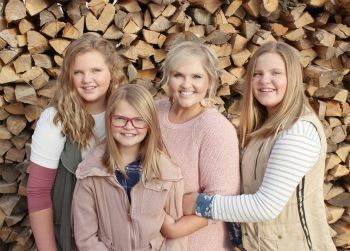 Thank goodness for Brooke, who suggested these woven wood shades. They keep the sun and heat out so much better, because they've got a protective lining on the back. Plus, I love the natural vibe that the wood material brings to the space; meshing really well with the earthy, raw feel of our tables finish. 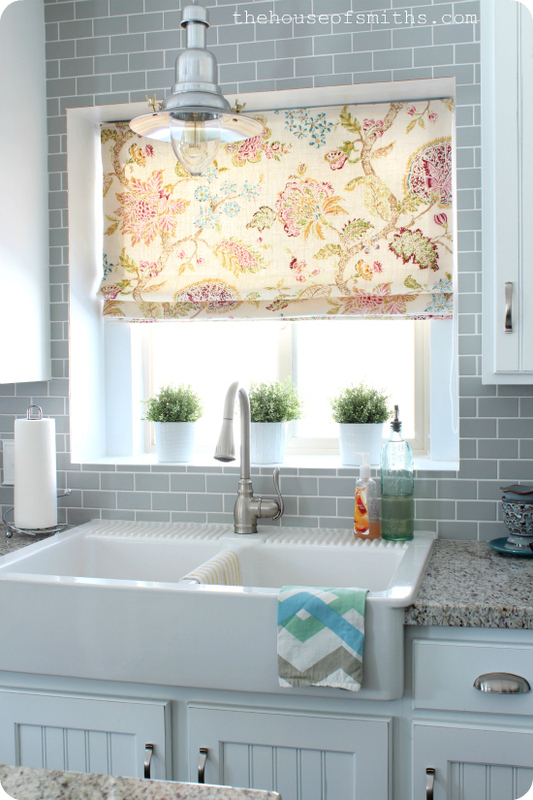 We fell in love with the roman shades over in our bay window so much, that we decided to take the same look over to our window by the sink, but this time with a fun, floral fabric, to soften all the hard lines of the tile and wood planked walls a bit. We had originally started out with a blue floral fabric to begin with, but in the end decided to go with a lighter variation, with lots of pops of color instead, to keep the space from getting too dark. I wanted the maximum amount of light to still be able to shine through my roman shade, but also provide us with the privacy we needed. ... and of course, you can't forget all the finishing touches. We're still working on a few things (like getting rid of all the Valentine's decor and maybe finding a fun table runner) so we'll keep you updated with those changes, but while I was at The Black Goose Design shop a few days ago, I spotted these great pieces that I knew would look awesome on my blue tray in the middle of our table... aaaand, since I know you guys are always asking about WHERE I buy all of our cute decor, Brooke and I thought it would be fun to do a giveaway for a few of the exact same things that we're using in OUR house, right now! Chalkboard Place Cards (as seen in our Christmas post) + Chalk Pen! Brooke and I thought about this a bit and we've decided that we want to know: "What sort of items does YOUR kitchen nook/dining room need?" Window coverings, decor, a great piece of statement furniture? If you could pick a few things to add to your space that would personalize it a bit more for you and your family, what would they be? there is a huge window in our kitchen, right in the eating area. I need some amazing covering to show it off as the focal piece it is! Thank you so much for a great giveaway! I would have to say painting the oak cabinets would completely change the kitchen and make it ours. My space could use some cute unique touches to give it a little more personality. Also some new appliances wouldn't hurt but that is for another year...Love your dining space! A new table with a settee too! :) We'd also like a new light fixture (w/ a large linen drum shade) above our table, buffet & roman shades above our kitchen sink. Thanks for the great giveaway! Oh my god I love your kitchen!! Great bench and window treatments ! I've been religiously reading your blog for years from France and I love your house (and your family). Thanks for sharing all your beautiful ideas. Bonne journée !! We rent in a duplex and cannot repaint the walls, so our kitchen could use some pops of color. Whether it be in the dishes or decor, just anything with a fun trendy color would do! I am in desperate need for a window over my sink. I currently stare at a blank wall while doing dishes in my dishwasher-less cottage. I'm becoming Jean Valjean! Our dining area, along with being very small, is a pass through type space. Every other room spokes off of it as do the stairs going to the basement/garage. The stairs are our daily way in and out of our tiny townhouse. We gave our old (space hogging) table to a family member and are now on the hunt for a small round table that is expandable for dinner guests. Finding a stylish one is not as easy as you might think. My new kitchen will need everything since we're just moving in! 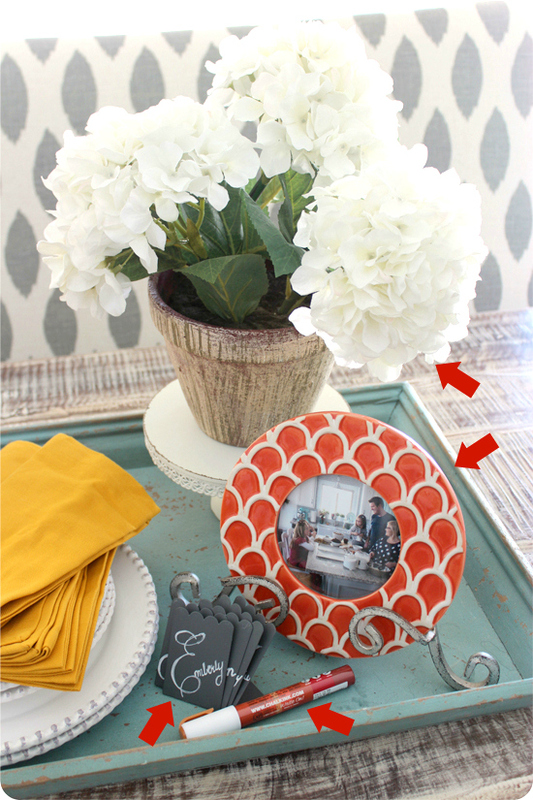 And I LOVE the orange scalloped frame! It needs a pretty centerpiece on the table. oh dear. My kitchen needs everything. Window coverings, new floors, new paint, new countertop and cupboards. Basically everything but a new fridge. ...and our sink is broken! hah! I desperately need a kitchen table. We DIY'd built in seating which has made finding the perfect table in the right dimensions a pain. In the end we're probably going to have to have something made. I really could use some paint and wood filler for my dining set - we've got a great pottery barn-esqe table and chair set but it was second hand and it's forest green (yikes) and has some dog chewed pieces! But the bones of the piece are awesome so I want to make it perfect for my kitchen. My kitchen definitely needs some style! I've recently moved in an d lack color, curtains and a kitchen table!! I just love your kitchen!!! I painted my cabinets white last year and the walls are now a light gray as well. Just love how light and bright it is. I love, love, love your eating area. Looking at my kitchen two things I would love to have in my eating area is possibly a rug and a small accent piece of furniture. My dining area needs chairs. We have a beautiful refinished oak pedestal table and I have not been able to find chairs to go with it. I love your changes. I am working on a plan for a kitchen update too and I want to paint my cabinets (which are now maple) and replace the backsplash with glass tile. I recently bought a round kitchen table and added rattan chairs and I love it. Need some new accessories too. Hope I win! My kitchen first needs paint - it tends to be too dark to suit me. I need a lighter color paint and then some fun pops of color - something to make it more cheery and fun! Love the updates! Planning an update for my kitchen soon too! Well, my kitchen needs much since it is 60 years old (we are saving the best for last haha) but I am trying to spruce it up with clean lines and special touches in the interim - and I would love any help I can get! Being in the military requires countless of moves, which means countless of dings and scratches to our furniture. We are in dire need of a new table and chairs, hopefully one with a bench for our growing family! I need new bench cushions! Your kitchen is really lovely. 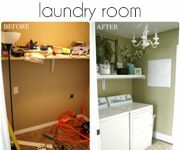 I am in the middle of a major kitchen renovation so I could list a million things that our kitchen needs right now! The two things that I would take right now are pretty shelf supports for our new open shelving and a table for our breakfast area. My kitchen needs a lot of color!! We are slowly trying to remodel!! My breakfast nook needs something added to windows like more moldings or window coverings as well as fun decor items for center of table. First I have to say I love your settee. It is gorgeous! Our Kitchen/nook needs a new table. We currently have an old pub table that I love but because of the space a round table would fit so much better. I would also like new chair cushions and maybe something on the table. I have such a hard time with that to put on tables. We definitely need new window coverings! 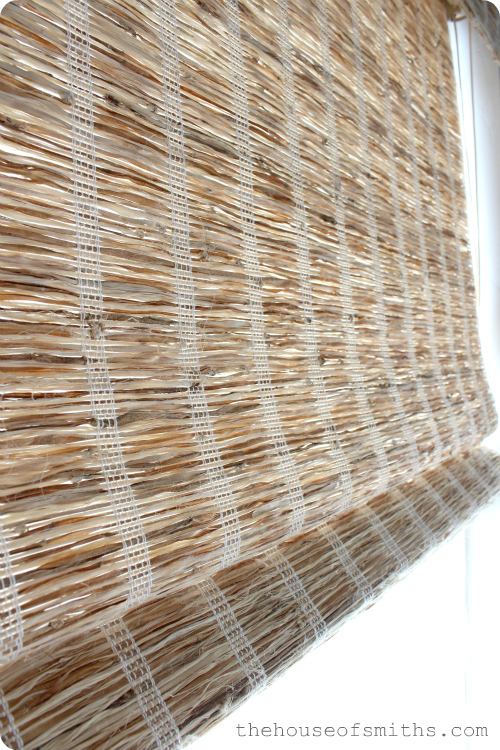 And, I love the idea of woven shades! We could use some cute chairs for our breakfast table as well! Wow that settee is gorgeous! Along with those curtains! So pretty and such a great combination of pattern and color! Our kitchen needs some wall art-desperately. We just moved a few months ago and it's a slow process deciding what each wall needs and finding it or making it. But, we're getting there! Love the kitchen nook....love your whole kitchen! I'd love to add a settee, bench or banquet to my kitchen. Hmmm, I love my dining room, but since we're dreaming, I would love a new table and chairs!Mine are old farmhouse style that I painted black a couple of years ago. It would be nice to pick out a new set - something I wouldn't have to do anything to! We NEED new barstools. My mom gave us an extra pub height table that ive been asking for for EVEERRR but we have no chairs! We have 6 chairs...each pair is completely different and out dated lol. It looks terrible. I cant wait to find the perfect stool! I absolutely love that settee! Your little nook has come a long way. I need a table and chairs in my "eat in" kitchen...so we can eat there! I think killer window coverings are key as my eyes are always drawn to the view or lack thereof. 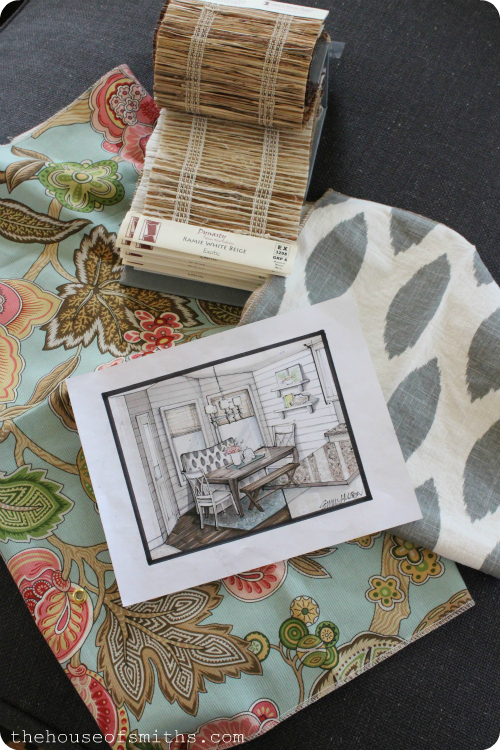 Would you mind sharing details on the wood shade and fabric used for the other shade? Thanks! Love the settee!! The pattern was definitely worth the wait! I could just sit and stare at the pic of your sink and the gorgeous shade above it! My kitchen needs a table runner, picture frame, and a little more color...maybe up high. We have the space above the cabinets and I've just left them blank for the last few months. Don't know if I want stuff up there or not. I need curtains, a new table/chairs, artwork in my kitchen nook!! I really need window treatments big time in my kitchen. I totally need a great piece of furniture. That would be a great place to start the ball rolling! I love everything about this! Can you tell me where you purchased your light above the sink? We need new chairs and window coverings. Honestly I live in an apartment and its hard to be stylish with beige walls! I really need a sideboard with storage for my dining room! My dining room needs a statement piece to make it look more special. We need window coverings, but since we just found out we are moving I will hold off to see what our new house needs! 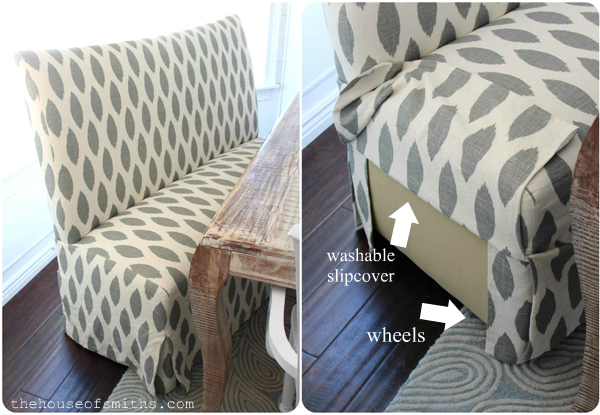 I HAVE to know where to find that fabric that is on your settee...I want it sooooo bad! Will you please let me know where it could be ordered from? Thank you! I could use lots of new things- rug, stools, dishes.... The list goes on! I am in desperate need of some window coverings that are kid friendly. We also have a bay window in our dining room with just pain old white blinds. It looks so BORING, but I'm afraid to put curtains up with 4 kids 6 and under in the house. Maybe this is a solution for our house too?! While I'm thinking of things we need, our 2 dining chairs at the heads of our table are getting pretty tired. (we've got benches on the sides too!) The ones we have are so BLAH and I'm thinking something fun and funky needs to come in and take over. Thanks for the chance to win! We need horizontal wall planks. LOVE, love, love what you have done with your kitchen!! Love the window coverings, so fresh and casual! My current dining room challenge is figuring out how to address our big bay window. I'm not sure how to get curtains on the inside vs. along the outside. The room will look bigger if they're inset. And, of course, definitely washable! I really need some window treatments for our bay windows. I love the light streaming in, but it looks a little too bare. I hadn't thought of roman shades! I would love to get plantation shutters. Unfortunately, I have 10 long and narrow windows which means custom made which means EXPENSIVE! I redid my kitchen a a couple of years ago.....walls, changed out dinette set for the cutest zebra strip and leather couch and leather ottoman to make it a sitting area! I just love it...the only thing I cannot "complete" is the window dressing for window in the sitting area.I cant find that fabric and style that would finish it off with the oomph I am looking for! I think my kitchen needs everything that you have just done - LOVE the entire look, great job!! Brooke and you have done an amazing job! I probably need to paint my oak table or chairs to be updated...and a lovely table runner would help. Our kitchen nook is in desperate need of new chairs. We currently use a hand-me-down table & chair set from my in-laws (from the 1970s or 80s). We also moved into our house about 6 months ago, so we need a lot of decor and personal touches. Brooke and you have done an amazing job! I probably need to paint my oak table or chairs to update them...and a table runner would be nice. I would love to have a window seat in our bay window. We have a small kitchen so we could use it for storage and extra seating. I want a tiered tray for my counter! I'm moving to a brand new house in 39 days (but who's counting?) and it will need color! The cabinets are white, dark floors and countertops, but no color. 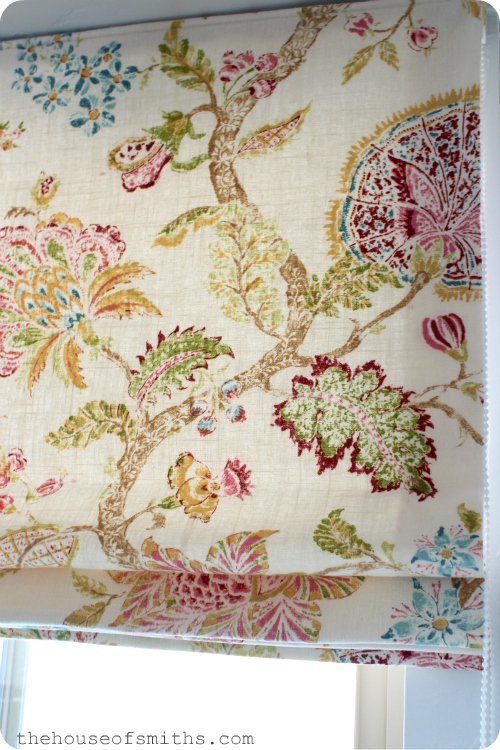 I'm busy day dreaming about window treatments and accessories that can warm up the space and make it home! Love the kitchen!!!! Great Job!! I have table envy for sure! I think my kitchen needs it all! I've had a kitchen update brewing in my head for a while now.... it could use 2 statement-type chairs for the ends of my dining table, a new runner for the "aisle" between my stove & sink, and some new window valances, which I think I am going to make! Thanks for the giveaway! Love ur color scheme! Great job! We need everything! We're fortunate enough to have a large eat in area thats part of our open floor plan and we bought a great farmhouse table and some leather parson chairs but there is no personalization. We have one small section of wall where I'm thinking of adding shelves. I also need curtains and some table top decorations! I'm dreaming of a new table, I love what you did and I want to do something different and unique as well. I love the idea of a setee. So stylish. My kitchen needs an update to the desk area. It's a drop off for everyone and I'd like to enclose the desk area into another cabinet. Where did you get your blinds (or, what is the brand)? Thanks! Living in a small apartment doesn't allow much room for decorating. We don't even have a table to sit at. But I'd love to add more color to my kitchen to make it as enjoyable to be in as possible! Pictures, pretty towels, cute canister... a girl can dream. 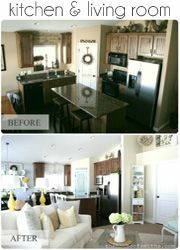 I SO want a new table and love the look of your new kitchen!!! Our nook is small too so we might just have to borrow a few ideas from you. :) You are my design hero!! Oh, and I definitely need those blinds for the entire from of my house; we have the very same problem and like you said the faux wooden blinds def. don't cut it. Thanks for more great ideas! We need new countertops. This kitchen has beige "orange peel" textured countertops that we don't really like. 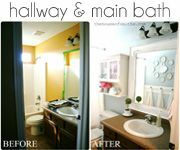 But I LOVE your 'pop of color fabric' over your sink!! It is hard to believe that you actually use all that beauty every day. It looks like it only exists in a photo! I would have to say a bit more organization. What is the name and brand of the wooden roman shades by the kitchen table? I'm loving them and need 4 of them for our master bedroom/bath. Thanks. Did you get a privacy liner with them? I would love a great piece of statement furniture, besides the table, I have a big blank wall perfect for something fabulous! We just had granite installed so there is nothing on my counters. I need to start from scratch. I would love to have built in seating for our eat in kitchen. We are in the middle of building butcherblock countertops right now. Noe we need new knobs and pools. I also need some new decor for my dining table. We have a small window in our kitchen. The view is horrible (the sideyard trash cans and AC units! ), but I would love to have a window covering that isn't yucky blinds. I want bench seating and new curtains soooo bad! My kitchen could use a bit of everything! It's a bit scattered, design-wise. I would love a few things to bring it all together. I really need new window treatments!!!! I would love a new dining set and some decor to tie my kitchen and dining room together. We just got a cute buffet table. It is in need of some finishing touches! Some new lighting. Something fun but definitely usable. Our kitchen is "fine" as is, but not "us". KWIM? I'd like to paint or refinish the cabinets, get a new dining table and chairs, paint the walls, add cute accents, etc. Easy peasy, right? Uhm... not! Some of us have indecisive-omnia. lol. I am in need of valances. The blinds are super boring. we need some color! 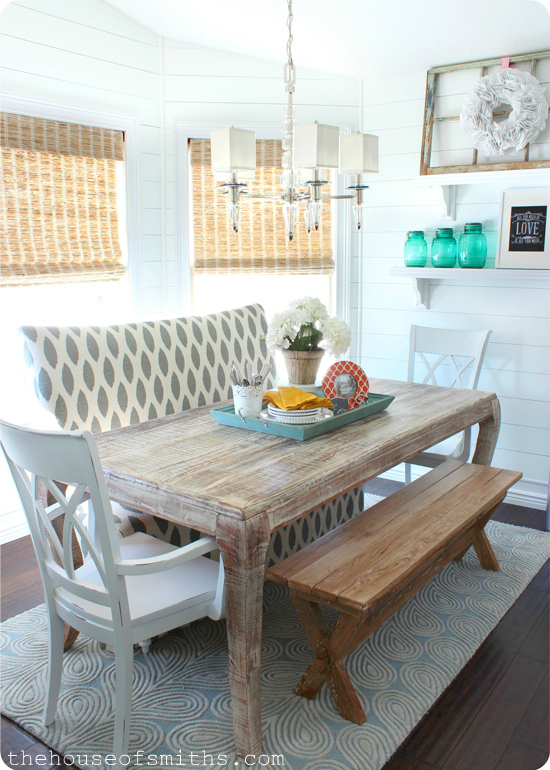 Curtains, a new table and new chairs--plus some accessories to warm it up! Well, my kitchen needs a total makeover. This house was built for a family of four, but we have a family of six, plus pets. I was thinking of making a bench seat for our kitchen table but and in LOVE with your settee. That actually might be our solution. I need something between the sink and the cabinet above it. It's just a bare, plain space that drives me crazy. Sadly, I can't put a window there, as it's not on an outside wall. I also would LOVE some fun chairs. We need everything...our nook is very sad. :) Our nook is shaped exactly like yours so I would love to do those same roman shades, beautiful dining table, and some chairs to go with it. I love your bench and the fabric. i'm trying to convince my hubby to opte for a similar kind of table. :) Nice job! Love your kitchen re-style! My kitchen needs fresh paint, curtains and general updating. Thanks for sharing your inspiring ideas! Better shades & area rug! Along with a few extra feet I need better blinds to screen sunlight, not block it. I need a few extra feet in my dining room!!!!! But some different blinds would be great to screen the sunlight a bit. Area shades & rug! Love the grey! My whole kitchen needs a makeover. I need a table. I love your space it's so calming! I would die of happiness if I just had a dining table with matching chairs! We're just using folding chairs for now until we can justify buying a set. I would like to paint, add some new open shelves in my breakfast nook. Beautiful what you have done! Thanks for the opportunity to win some stylish accessories! Everything! I'm dreaming of your new beautiful sink. LOVE! I would like to paint and add some open shelves to my breakfast nook! Beautiful what you have done to yours! Thanks for the opportunity to win some stylish accessories! A new table with a cute settee for sure. I desperately need window treatments over the sliding door and the kitchen window! I desperately need window treatments on our sliding door and the kitchen window! I ADORE EVERYTHING about your kitchen reno!!!! Love the table/settee/chairs...love the walls....the rug....the blinds....yeah, EVERYTHING! We need new lighting and window treatment! Love your you new look! I love it! I would love a beautiful table runner for our dining room and a nice big mirror to go near the table. We just moved in to our new apartment, and it is still such a blank canvas! I need to update the decor in my kitchen. I also need to refinish my table, it's black and has heat marks all over it. My kitchen needs some color! In any way, shape or form. I'd love to add some decor to our kitchen. And maybe a new beverage station! My kitchen/dining area could use some accessories and maybe a table centerpiece that make the room more inviting. I would love to have a kitchen island that doubles as a workspace as well as sitting area. Oh and new light fixtures are wanted badly. My dining room serves double duty as an office, and right now what it really needs is some shelving to hang over the desk, for extra storage and some pretties! I also want a vintage looking sign to hang in my kitchen. I'm hoping to eventually paint our table and get light weight chairs. Our current ones are so heavy and big. I need to paint, wall treatment and new lighting over the table...a total re-style! It was new in 99, but needs an update for sure! Putting that tray on the table hit me like a ton of bricks! I like to have flowers our vintage napkin holder and a bowl of fruit on the table but it never looks quite right. A great tray will pull it all together. Definitely an aha moment for me. I need shades, I'd love some bar stools since we always need more seating, a rug and some color to pull it all together. I feel like my kitchen and eating area need a better flow. I'd love a new table, however the biggest challenge is lighting up the room. We have no electrical in the ceiling. So I try and use brights and whites to keep the room lighter. I would love to have a new dining room table, looking for something with a pop of color! I am currently redesigning my dining room. My kitchen is non existent. We live in military housing so yeah not a lot going on. I need decor. I have the fabric for drapes, but the kid friendly non breakable decor is a much needed thing. And a durable table cloth. Something to protect the table but is oh so tres chic! I would love a new farm table with some amazing chairs and some cute decor! I would love a new farm table with amazing chairs and some cute decor! Our house needs too much to even list! I'd love a new dining table, as ours only seats four. But the worst is our drapes and cornice, they are too model home-y and are -dying- to be replaced! What I love in our dining room is my great great grandmother's buffet table. I love it because it's so special but I hate it because when it gets any tiny knick on it I'm in tears. Oh goodness. The question should be, what doesn't your kitchen need! Haha A new rug, new shades and lots of accessories! Love love love the settee btw! I'm going to be making pillows for my daughters room with that print soon! I am in need of A durable protective fabulous tablecloth for my table. And I am in high need of tres chicdecor!! Oh boy, to name one thing we need in our kitchen or dining room is hard!! Two things that stand out are a simple centerpiece for our kitchen table and decor for above our cabinets. We have 3 to 5 feet of space above our cabinets and I am at loss on what to put up there! Thinking a large cloce in one stuff. We had a flood that ruined about 800 sq ft of our beautiful dark hardwood floors, most of it in the kitchen. So, not only do we ned new flooring, but I'm taking the opportunity to completely re-think the direction I want to go in terms of decor. New table, chairs, window treatments... you name it! I think our dining room needs the most attention because our large family does a lot of gatherings and family dinners. Our windows need some jazzing up and our large table is missing some decor! I'd love to do a round table in our dining area! With a young family of 7 I would love a large white (yes I'm crazy) circular table in my dinning room. I also want a cool lazy susan for all the dinner must haves. It would be fun. My nook needs a new table & chairs desperately!! Cute space deary! I just bought a round flat dish for my kitchen table but Im not sure what to display in it?? Where to start? My kitchen is in a serious need of new cupboards, counters and floors! On a smaller scale I would love new window treatments! I'm dreaming of a new banquette custom built just for our tiny nook. If you think that your kitchen is small, take a look at ours! hah! Id love a smaller round table with stools! I have quite the list....we need a new table and I would love some sort of curtains or shade for our huge window. We need soft cushions for our built in nook....just looking for the right fabric that won't stain too bad! My kitchen needs a new dining room table. I'd love new chairs and a banquet bench for our kitchen in our new old home! I would love your entire kitchen! I'm looking for the perfect versatile centerpiece for our table. Our dining space is tiny but I dream of the day when I can use a bench or settee similar to yours. Adorable and soooo comfy! I have a very plain streamlined 1950's kitchen. I need to work on designing an installing moldings to give it more of a traditional flair. I think paint and decor but I'm really hoping to get a new dining table soon. Love your room- you are amazing!! Love your nook! Very inviting. I could use a rug, some sort of table runner and am in desperate need of something on the wall! Thanks for the ideas. Thanks for the great ideas! Love your nook - very inviting. I desperately need something on the wall and a rug! A table runner wouldn't hurt either to pull things together. Ours MOST definitely needs some kind of seating solution. We have a table that fits SO well, but no storage/little decor because it's SUCH a tight area and where the "doorway" is into the kitchen! I have a lot of things to address, but my biggest problem is a very large bank of windows that span one side of my kitchen. I love the light and openness, but desperately need some sort of window coverings that keep out the heat in the Summer and give us some privacy. Help!! I need new window coverings SO BAD! The window above the sink is bare naked and the vertical blinds on the sliding glass door aren't functional anymore. I'm tired of feeling like a fish in a fish bowl. We move it FORTY days, and I am not convinced our table will even fit in the new place! Eeek! So..maybe a new table. um lets see everything! we r waiting to pay off the house before doing the kitchen. I want your entire Kitchen!